Heat is the killer of electrical wiring. Heat’s bad for a lot of things… ;-) It degrades the wiring insulation which over time can crack resulting in electrical shorts and some seriously wacky and near impossible to diagnose problems. 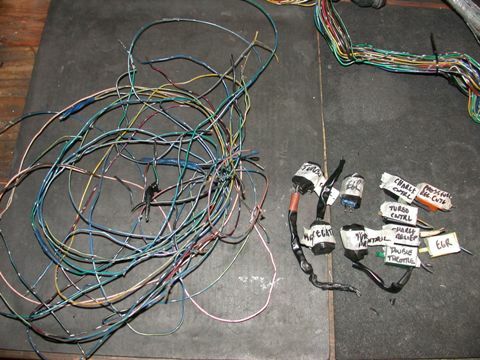 Wiring harnesses are typically ok for about 10 years (my estimate) so long as you don’t’ mess with them. Touch the harness or bend it during engine work or engine removal and you introduce a possibility of an electrical wiring failure. 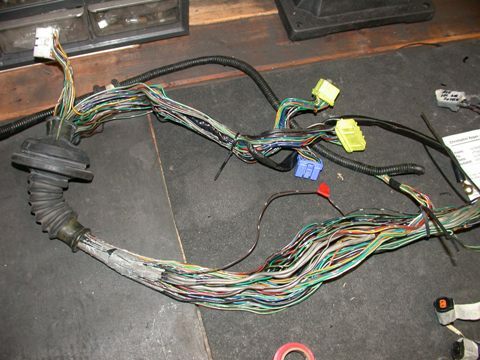 My car, produced in April 1992, with quite a “few” track miles, had a “toasty” wiring harness. In fact the section of the harness that passes over the turbo downpipe was absolutely fried with wires inside the harness jacket exposed and “browned.” It is highly likely that this was a contributing factor to the cause of my engine failure. Specifically, the harness may have failed to send a signal to the injectors (secondary rear injector?) and which resulted in a lean fuel mixture and presto-chango I now had an expensive Jiffy-Pop popcorn (sound) maker. 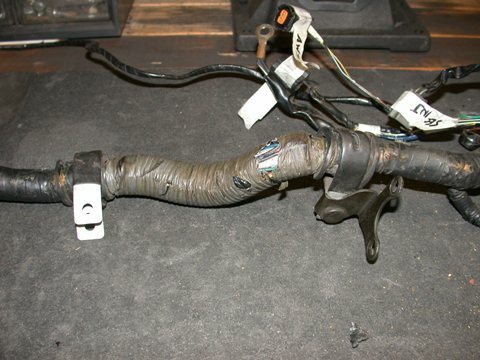 Melted and burnt wiring near the exhaust downpipe. 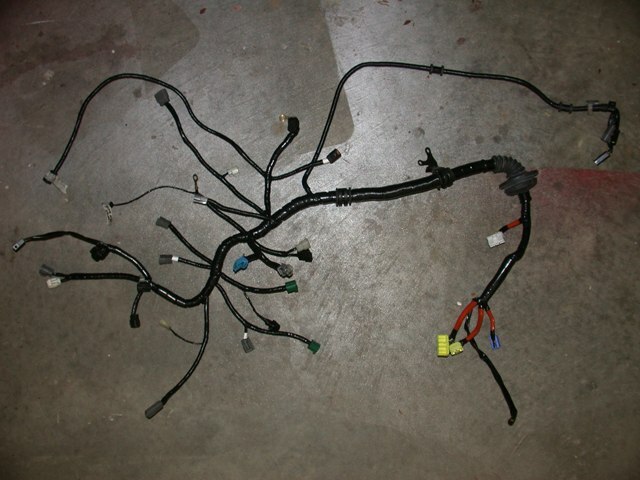 I needed to address the issue of my wiring harness. A new harness would be $700+. I decided to rewrap my own harness. My car is relatively low mileage and after further examination of the harness it was only the one section over the downpipe that needed some serious TLC. Additionally I wanted to simplify the harness. All of those unused turbo control solenoids had to go. No need for them anymore and while I had the harness apart why not weed them out? Labeling of each connector in preparation for weeding. First off before I touched anything each connector was labeled clearly. Then the harness was carefully unwrapped. 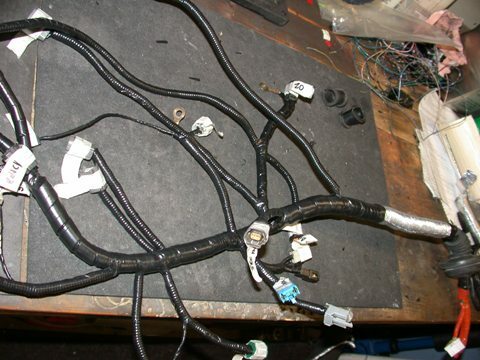 Each unnecessary connector was then removed and the wires to it were traced back to the ECU connector or relevant ground wire splice and those removed also. I did not remove the big firewall grommet from the wiring bundle but simply pulled the unused wires through it to remove them. 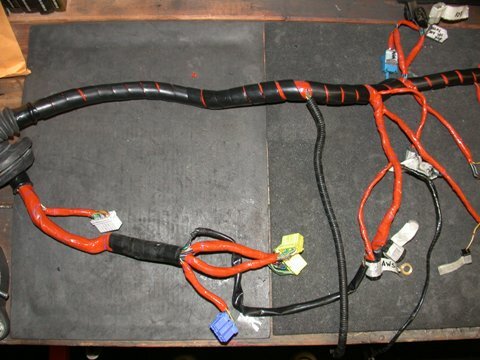 Be sure to note where the main wiring harness junctions are so you know how to rewrap the harness! The pin in the ECU connector was also removed using a small tip flat head screwdriver to make the weeding as clean as possible. Sliding the flat tip screwdriver down into the plug next to the pin will release a small tab and the wire pin can be slid out easily. 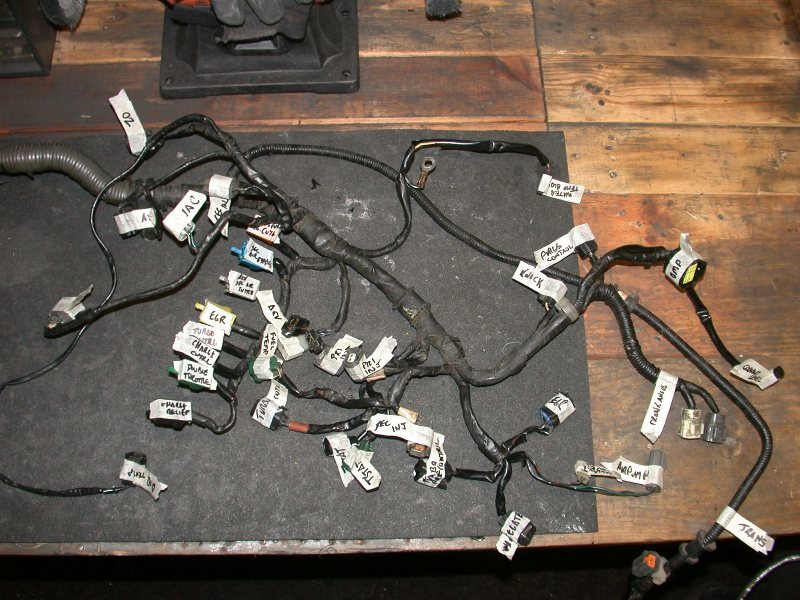 An unwrapped wiring harness. The leftover weeded wires and unused connectors. 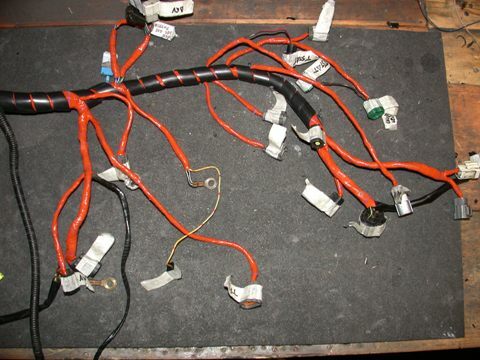 With all the weeding done, I repaired those sections that looked unreliable and all the remaining wires were first rewrapped in the original arrangement using a self sealing insulating rubber wiring harness wrap (orange in color in images). This was then reinforced with wiring loom spiral wrap. Two wires to a single plug were sleeved with standard accordion flex sleeving. The whole harness was then wrapped in electrical tape to hold it all together. 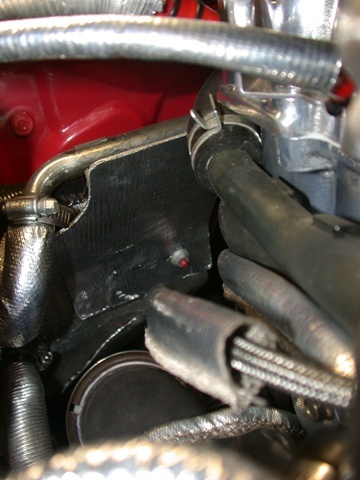 I did add an additional thermal sleeve in the section that runs over the downpipe and the section directly over the engine block. These two sections were then again wrapped in electrical tape. The cleaned and rewrapped harness is now simpler (thinner!) and more flexible and durable for reinstallation and in the long run no doubt more reliable. Since I was so concerned with the downpipe section, as an added precaution, I also fabricated a small heat shield, fixed to the firewall, to directly block any radiant heat from the downpipe cooking the wiring harness. Oh...and I polished the bracket. Rewrapping the harness. Self sealing wrap (Orange) and wire loom reinforcement (black spiral) prior to final rewrap. The final wrap. note exta thermal insulation in particualrly hot regions, i.e. over the DP. Heat shield for protection from DP heat. 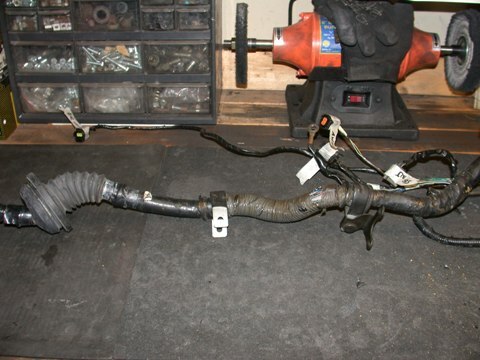 While I was in the mind to rewrap some wiring I also rewrapped the ignition coil harness, the TwinPower harness, and the ignition side main wiring harness back to the firewall, although not quite down to the individual wires like with the main wiring harness. The old harness wrap and sleeving was in some places oil soaked and needed to be replaced. Now it looks new and is much more pliable and certainly will be more reliable in the long run. Associated with the electrical wiring work I installed a GM 3 Bar MAP sensor. With enough fuel and turbo to well exceed 14 psi boost the proper engine control system is imperative. The stock map sensor cannot exceed about 17.5 psi. I tested mine and it topped out at right about 17psi. I’d submit that the accuracy also diminishes prior to that, possibly around 16psi. With the potential to nudge 17-18 psi on the new engine and fuel setup, using a higher pressure MAP sensor was prudent. Two options present themselves: the expensive Apexi MAP sensor kit for the PFC or the significantly less expensive GM unit. The beauty of the Apexi sensor is it plugs straight in. The GM unit requires some rewiring, or you can buy the premade adapter wiring from Banzai Racing. I chose the latter – call me lazy. I whipped together a fancy bracket to hang the GM sensor and all was done with the installation. The next step was to calibrate the GM unit with the PFC. From reading, the Scale and Offset for the GM sensor can vary in range. One key is to see if the PFC registers 0 “pressure” when the engine isn’t running…makes sense. Also a cross check between what the PFC is reading and what a boost pressure controller such as a GReddy Profec is reading can also be used to verify the accuracy of your input Scale and Offset values. I’ve seen values ranging from 7585/0 to 6986/347 to 6525/0. I ended up using XXXXXXXXXXXXXXXXXXXX as verified by Ray at PFS. 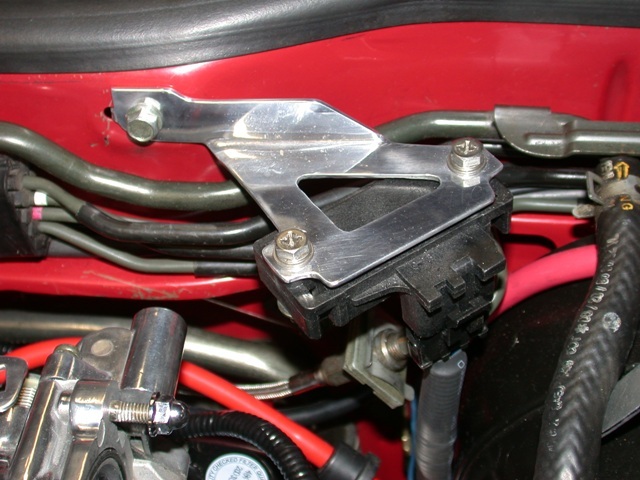 3 Bar map sensor on custom made bracket.